I would highly recommend ALLURA to anyone interested in laser hair removal, facials, peels, microdermabrasion , spider vein removal etc. As I have had all of these treatments and I am extremely happy with the results. Laser vein removal, also known as laser vein treatment is the most effective way to get rid of unwanted and unattractive spider veins, by destroying them with non-invasive lasers. The laser focuses on the pigments of the spider veins, heats them up and causes the veins to break down without disrupting any other area of your body. The first few weeks following your treatment at our Mississauga location, you’ll start noticing fewer and less noticeable veins! A laser is a highly focused beam of light and it can be used to treat spider and varicose veins. 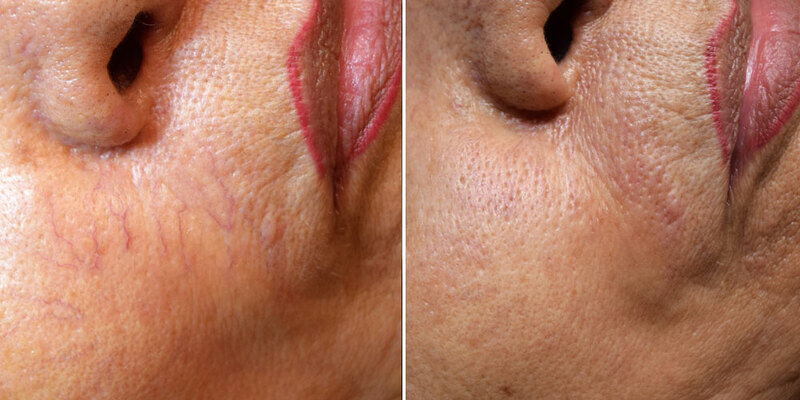 Laser heat modifies a vein, which makes scar tissue form. This scar tissue closes the vein. A closed vein loses its source of blood fades away. After a while, the vein is likely to disappear. Laser vein removal is done on the outside of your skin. It can treat spider veins and tiny varicose veins just under the skin’s surface. Usually, more than one laser session is needed. They are scheduled every 6 to 8 weeks. What Areas Respond Best to Laser Vein Removal? Most popular areas to perform laser vein treatment are Legs, Face and Arms. Public interest in laser and light treatment of leg veins is high, and, under the right circumstances, excellent results can be achieved with this treatment. Most patients require between 2 to 6 laser vein removal. Call or visit our Mississauga laser vein removal centre to learn more about our non-invasive treatments. Or learn about other laser skin care services.